“There are moments when art attains almost to the dignity of manual labor.” The quote is Oscar Wilde’s and the words have a special significance for Gail Pidduck. She has, with paint and the eye of a discerning artist, created stunning tableaux of farm workers in the Santa Clara Valley. Carmen Ramirez, a collector, says of Gail that she “illuminates the lives of people who are many times invisible to the rest of us.” Her work lets us see with greater clarity the every-changing colors of our mountains, the gentle symmetry of orange groves, graceful young dancers celebrating their heritage. 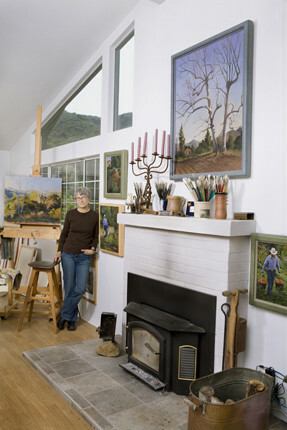 Gail has exhibited throughout the country, locally at the the Carnegie Museum, the Museum of Ventura County, the Buenaventura Art Association, and the John Nichols Gallery. Gail Pidduck’s documentation took place in 2006 and was sponsored by Cherie & John Brant and Lainie & Peter Cannon. The FOTM Archive contains extensive information about this artist.